A wonderful way to make a personalized, yet timeless statement in new construction or a remodeling project is to add the brilliance of fused glass: Artistic, one of a kind, and handmade. There are many new ways to add glass as an architectural feature. The opportunities to add glass to several rooms in a home or public space are endless. Home or business address numbers can be added to a plaque to make a beautiful and welcoming entrance. The entry way of any space can be enhanced by the addition of handmade fused glass sconces. 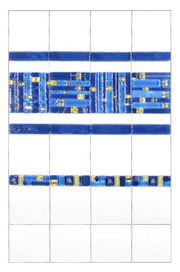 The variety of color and pattern available in fused glass provides a uniqueness not available in manufactured light treatments. A few handmade glass tiles interspersed among commercial tiles of glass, metal or ceramic, add simple elegance to a kitchen back-splash. For a more complete statement, a kitchen counter and back-splash can be finished entirely in custom fused glass tiles. Glass drawer and cabinet pulls can be created to match the rest of the kitchen. Imagine a walk-in shower made entirely of handmade glass tiles! Glass tile is perfect for baths. It is virtually maintenance-free, easy to clean and requires no sealing. Another eye-catching way of using handmade, fused glass is to frame a mirror in it. This can be a beautiful accent above a fireplace. Additionally, a small, yet colorful statement can be made by placing a beautiful glass disc in a round window. An additional feature is the privacy this adds. An Oregon fused-glass artist, who creates work in this manner, is Terry Brown. Perhaps it's the beauty of her surroundings and her creativeness and competence that make her unique pieces sought after by designers and architects throughout the United States. Serious glass artists work with a broad palette today, and are able to color-match their glass to paint and fabric samples.To bring a personalized touch to remodeling or new construction, fused glass should be considered as a finishing statement for several areas of the project.